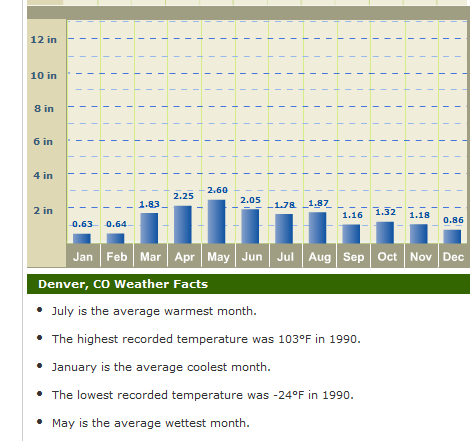 Denver has four distinct seasons and each one varies drastically from the others. The majestic Rocky Mountains to the west cause Chinook winds (dry and warm winds) to heat this arid High Plains city, resulting in generally mild temperatures year-round and 300 days of annual sunshine (more than Miami or San Diego). Though impossible to predict, the following presents a guideline for the general weather conditions of each season in Denver and in the nearby Rocky Mountains, an important part of the Denver culture and lifestyle. Dry heat characterizes the Denver summer, though temperatures do not usually reach scorching and average in the very comfortable 70s-80s. In 1999-2005, drought was a major problem causing water restrictions and brown vegetation, but the Denver summer is beautiful and great for outdoor activities, especially in the mountains just a short drive away where the temperatures cool and wildflowers bloom. In August, fragrant afternoon thunderstorms are fairly common. 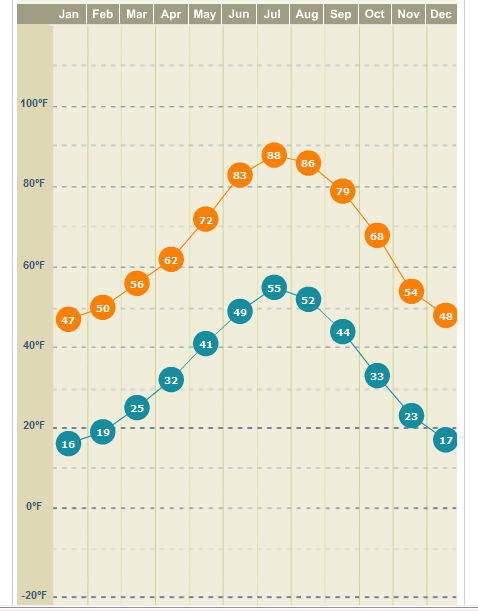 Denver fall averages cooler and crisp temperatures, but conditions vary greatly to reflect the fickle transition from summer to winter. Autumn leaves are beautiful throughout Denver and even more so in the mountains, where bright golden aspen groves are a popular destination for tourists and Denverites alike. The first snow usually falls in the city in late September through early October, after which snowstorms become unpredictable in frequency and magnitude and alternate with both warm, sunny days and chilly, breezy ones. Denver ski resorts begin opening in mid- to late October. Snow falls sporadically in Denver throughout winter, though usually melting quickly in the persistent Colorado sun—cold or cloudy spells rarely last more than one or two days. Temperatures are surprisingly mild, averaging just around freezing point. The mountains, however, remain snow-capped throughout winter, and skiing conditions are world-renowned but can be quite cold with icy winds at times. March is the snowiest month in Denver, often with the biggest and most unexpected blizzards, and springtime brings the greatest weather variety. In the mountains, spring skiing is warm and sunny, and Denver resorts stay open at least until mid-April. As the mountain snow begins to melt, runoff brings Denver to life with flourishing green vegetation and bright flowers.